This epicurious.com recipe is quite good and simple to make. 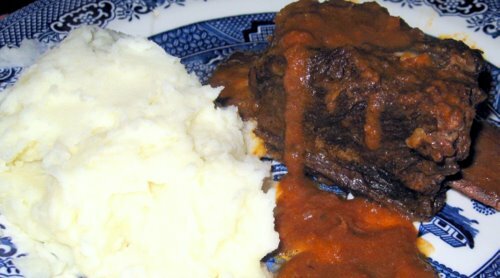 Most importantly, I had all the ingredients to prepare them at home, the only thing I had to buy were the short ribs (on sale at Lucky’s for $3 lb). I’d made the recipe before and liked it quite a bit then. It was very good this time too, though I would have liked to cook the short ribs for another hour (alas, I didn’t have the time). No matter, the kids didn’t eat any so I have enough leftovers for another dinner – I’ll just add some wine & chicken broth to the sauce and give them that extra cooking hour before we eat them next time. To give yourself plenty of time to make this, start it 4 hours before you want to serve it. I followed this recipe quite closely, though I used considerably less liquid as my pot was full. I still ended up with way too much sauce. I served this with mashed potatoes and it was very, very yummy. Put the peppercorns, bay leaf, salt, rosemary and sage in a food grinder, and grind until well combined. Rub the mixture all over the short ribs, set aside. Heat the oil in a wide, large pot over medium-high heat. Working in batches, brown the short ribs on both sides. Remove short ribs and set aside. Pour off the oil and discard. Put the pot back on medium heat and deglace with the chicken broth, scraping all the browned bits from the bottom. Turn off heat, pour broth into a bowl and reserve. Add the olive oil to the pot and heat over medium-low heat. Add the onions, carrots and celery and saute until browned, about 12 minutes. Add the tomato paste and sauté 2 minutes. Add the reserved chicken broth and bring to a simmer. Return the short ribs and any accumulated juices to the pot. Add the wine and bring to a boil. Reduce the heat to low, cover and simmer for 2 to 3 hours. Remove short ribs from pot and set aside. Working in batches, pour the sauce into a blender and puree until smooth. Return sauce to the pot and boil until it has a thick consistency. Return the short ribs to the sauce and cook over medium heat until the short ribs have heated through.